This article package was published in the May 25, 1911 Indianapolis Star. It focuses on Joe Horan's practice accident on May 24, 1911. Horan was driving the #12 Amplex, an ill-fated machine that may have been wrecked by Art Greiner during the first Indianapolis 500 (although there is information indicating it was not), causing the death of riding mechanic Sam Dickson. Horan could not drive the race, but was able to talk doctors into letting him watch the event from recliner chair atop the roof of the infield hospital at the Indianapolis Motor Speedway. 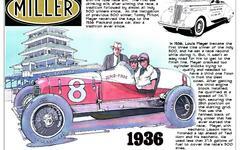 This article also chronicles the arrival of top drivers Bob Burman and Fred Belcher. If anyone has information about whether Greiner's Amplex was the same car Horan wrecked, I'd be delighted to hear from you!